CELESTINE -- A Birdseye man is in jail after allegedly crashing into a cow while drunk Monday night. Police say 46-year-old Daniel Madden crashed into the cow on South State Road 820 East just after 9:30 Monday night. An eyewitness tells WITZ Radio News the driver tried to flee when officers approached his vehicle, driving off about a thousand feet before coming to a stop, possibly due to the extensive damage to the car. The 2,000 lb. cow, according to that eyewitness, rolled over the top of Madden’s vehicle, crushing down the roof, breaking both the front and back windshields and forcing crews to cut him out of the vehicle. Police reports show Madden blew a .16 and was arrested for OWI and Leaving the Scene of a Property Damage Crash. 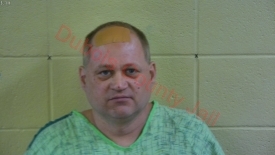 He’s held in the Dubois County Security Center on $500 cash bond for each of the two counts.